5 Ways To Use Landscape Containers To Beautify Your Home - Fox Hollow Landscaping and Design, Inc.
With the number of outdoor decorating ideas available nowadays, homeowners can find a wide variety of ways to set up their very own outdoor paradise. In addition to creating a lush, green lawn, homeowners can fill the space with landscaping decorations that are both tasteful and beautiful. Creating natural borders and using landscape containers to beautify your home is one way to both provide structure and allure to your lawn. Containers can make your landscape appear elegant and chic or trendy and sophisticated and everything in between. Whether looking for plants that are ideal for New Jersey climates or a way to create borders, homeowners can easily create a charming space to relax or entertain friends and family. Incorporating landscape containers into your garden is one of the best ways to add function, form, and beauty to the space. Continue reading to learn how you can use landscape containers to make your home’s exterior more attractive. 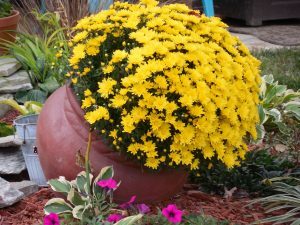 Consider the many different containers that can be used for the plants in your yard. Vertical planters that will allow you to attach the container to the wall are great ways to conserve on space. Porch planters can also be used to provide decoration along the driveway and near the front and back doors. Another way to use containers as a part of your exterior landscaping is through tiered flowered beds. By stacking planter containers on steps that are part of the landscape, homeowners create a space that adds depth. With the right approach, homeowners can allow their vision of a lush garden come to life. Planter containers can also be used to create borders. Larger containers can be used to hold plants that line the driveway or to contain small trees. Smaller planters can be used to line the sidewalk leading up to the front or back doors. No matter the size, planters can create a fluid border in a garden space that pulls your garden together. Homeowners looking to decorate their yard with creative materials can do so without sacrificing their vision of a classy appearance. Well-cleaned concrete blocks can serve as planters while also providing your landscape with some boundaries. Use the natural features of your yard to your advantage to maximize the space and objects in your yard. For example, large stones can be hollowed out and used as planters. Depending on how chic your landscaping plans are, you can also hollow out logs and use them as planters for a more natural look. The perfect plant is just as important as the planter itself. 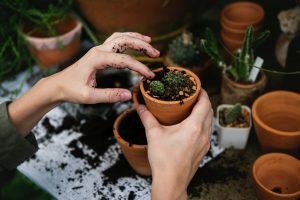 Using landscape containers to beautify your New Jersey home simply requires you to find the right plants to fill the pots. Flowers indigenous to the environment, including anemones, asters, astilbes, basket-of-golds, bee balms, blanket flowers, chrysanthemums, and more, are manageable plants that can make your home’s exterior more pleasing to the eye. Landscaping containers provide several functions to your home’s exterior. They can be used to provide structure and borders for the yard. More importantly, though, they beautify the landscape when accompanied with the right plant. Get in touch with Fox Hollow today and let us show you how these containers can increase your home’s curb appeal and leave you with a beautiful garden for all to enjoy.